...it's fun being able to build your own headset, but once that's done you're left with a pricey pair of stereo cans that lack certain mod-cons. When we reviewed Fnatic's Clutch G1 gaming mouse late last year we came away impressed by the product's focus on core features that matter to gamers. The no-frills approach played well with the target audience, so it's a surprise to find that the firm's first headset is an elaborate piece of kit aiming to tick more boxes than gaming alone. Adopting Aiaiai's modular approach naturally raises costs, and at £180 the Duel headset risks landing in no-man's land. Sure, it's fun being able to build your own headset, but once that's done you're left with a pricey pair of stereo cans that lack certain mod-cons. A relatively streamlined feature set means that sound quality is put into sharper focus, and the 40mm titanium-coated drivers do just enough to impress. Lows are served with with a good punch, the mid-range is clear and though highs are lacking a touch of definition, music and games are pleasantly delivered. One potential proviso is that the boom mic isn't as effective as we'd hoped, as voice often came across muted and subdued. What's interesting is that the choice of earpads has a bigger impact on sound quality than we'd anticipated. To our ears, the review sample sounds significantly better with the over-ear pads, and though we appreciate the smaller profile of the on-ear option, we're not sure we'd want to routinely revert to a configuration that doesn't sound quite as good. Bottom line: there are better gaming headsets available for less, but Aiaiai's TMA-2 continues to develop as an intriguing piece of kit and gamers keen to buy into the modular concept now have an obvious starting point in the form of the Fnatic Gear Duel. 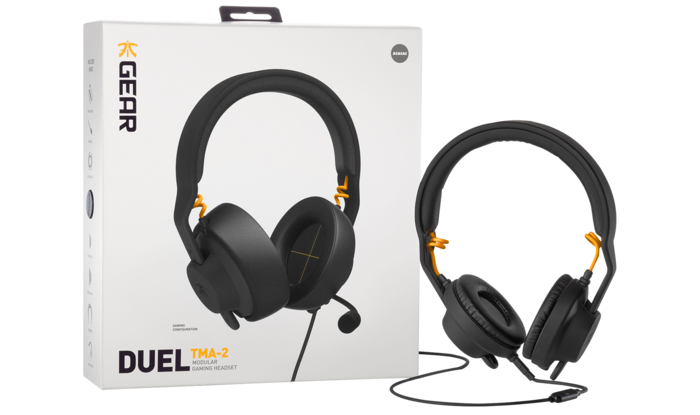 The Fnatic Gear Duel TMA-2 Modular Gaming Headset is available to purchase from the Fnatic Shop or Amazon UK. I've actually an Aiaiai TMA-2 lying around. Is there any way to upgrade it with a mic using the Fnatic parts, and if so, which? Alternatively. One could buy a cheap set of headphones and a microphone. Totally unheard of, I know, right? Either way, rather than some tacky “pro-gamer” crap, a decent headset (if you must) like sennheiser PC37x (massdrop, will come back up for another drop soon) or hyperX will run rings around this. Don't sell the Aiaiai TMA-2 short. This is actually a very good headphone. Or should I say, series of headphones, as you can configure them to your own liking. Have a look at the configurator. The “Young Guru” preset is especially nice. I seriously doubt that adding a mic on the Fnatic edition will ruin the sound quality. are Duel's modular capabilities just a gimmick? Well, no, not entirely. On paper having a choice of configurations makes good sense. Gearing-up for a long gaming session? Then opt for the boom mic and larger earpads for a wider soundstage and better isolation. If you'll be using the headset while on the go, the in-line cable and on-ear pads create a smaller and lighter offering. …or… spend the £180 on a gaming headset and some headphones/earbuds for “on the go”. Actually, even head-fi didn't mind them. The S02 being the only module for speakers that isn't a bassy mess.